Indianapolis—Orr Fellowship extended job offers to 64 candidates from the largest applicant pool at the conclusion of organization’s interview day on Nov. 9. Since 2002, Orr Fellowship has matched high-achieving college seniors to full-time jobs in Indianapolis. In addition to working at their companies, Fellows participate in Orr’s programming dedicated to nurturing the entrepreneurial spirit and developing strong leadership skills. Fellows are also tasked with recruiting the next class of Orr Fellows. From August to September, current Fellows actively recruited college seniors from across the midwest. 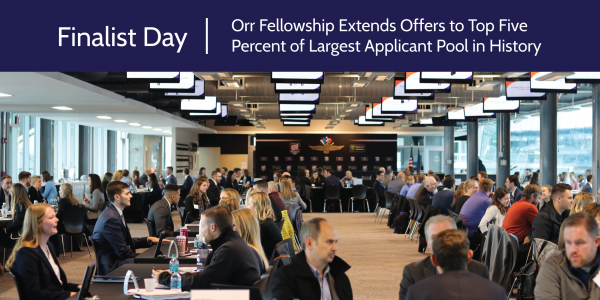 Of the over 1,200 college seniors that applied during that time, just 96 were invited to a one-of-a-kind interview day at the Indianapolis Motor Speedway, which Orr Fellowship refers to as Finalist Day. In addition to candidates, 132 Indianapolis business executives lined the fourth floor of the media center at the IMS where they conducted 412 interviews over the course of seven hours. Through a unique matching process distinct to Orr Fellowship, 64 candidates received calls that same evening with job offers from one of the companies they interviewed with earlier that day. The new class of Orr Fellows will move to Indianapolis upon December or May graduation, and begin their jobs shortly thereafter.